Easter is fast approaching and we have been getting ready in our house. 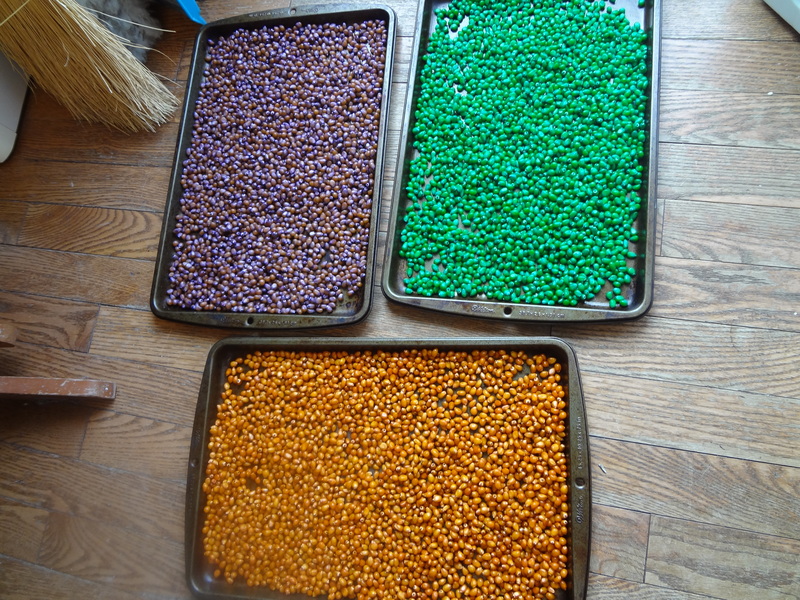 Yesterday I read on how to dye corn kernels for sensory fun or crafts and knew I had to try it, so I decided to make an Easter sensory bin. 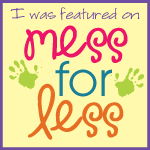 You can find the tutorial here on Fun-A-Day. 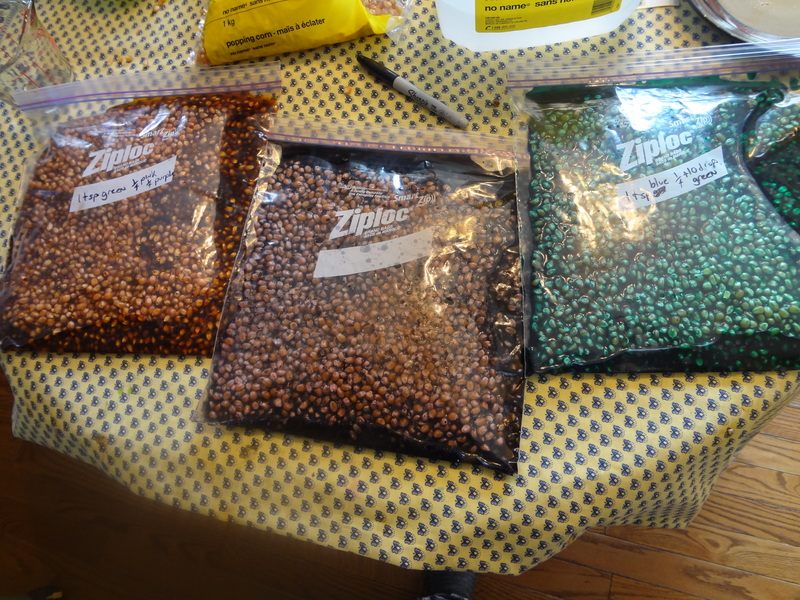 http://fun-a-day.com/how-to-dye-corn-kernels/ It was an easy tutorial but I wanted to make some fun colours. I made the recipe without adding the food colouring, I made 3 batches. 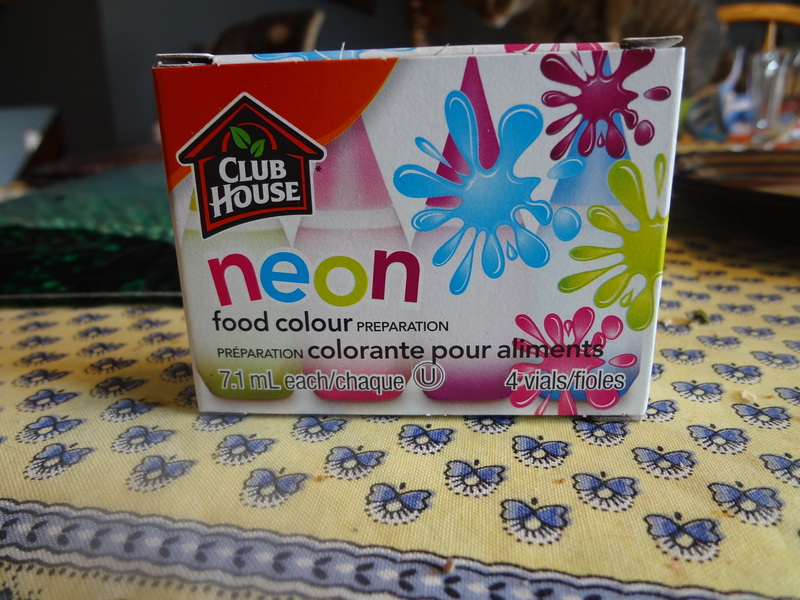 I used this neon food colouring I found at Zehrs. After a bit of experimentation I made these. The purple is 1 table spoon of the purple dye, simple enough. For the green/teal colour I used 1 teaspoon of the blue and 1/4 a teaspoon plus 10 drops of the green. Lastly for the neat deep orange I used 1 teaspoon of green, 1/4 a teaspoon of purple and 1/4 a teaspoon of pink. These measurements are for every 2 cups of corn. I let them soak overnight as instructed. In the morning I spread paper towel on baking sheets and drained the excess liquid with a strainer and gave them a quick rinse (not to long) and spread the kernels evenly over the paper towel, dabbing the tops with another piece. (If you don’t let them soak over night you won’t get as vibrant a colouring.) An hour later I removed the paper towel, dried the pans and spread out the kernels again, and left them for a further 6 hours, shifting their position once to help speed up the process. It turned out wonderfully! They are so vibrant and bright! I threw in some Easter eggs, the hollow plastic ones. I filled one with some of the kernels to use as a shaker and added some fluff, different types of eggs, a little plastic bunny and a scoop. We brought it outside to play with since it was so nice out and we’ve really missed the sunshine this winter. 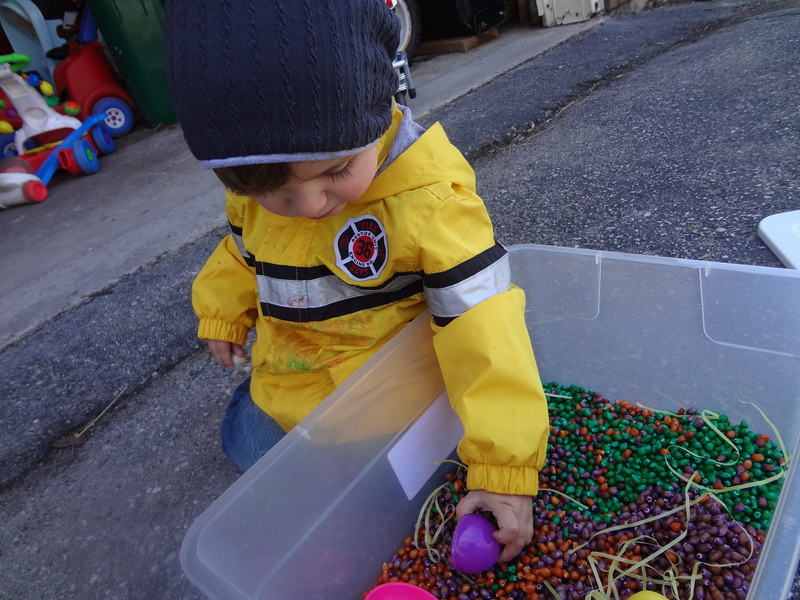 He had a great time scooping and pouring and really liked the shaker. 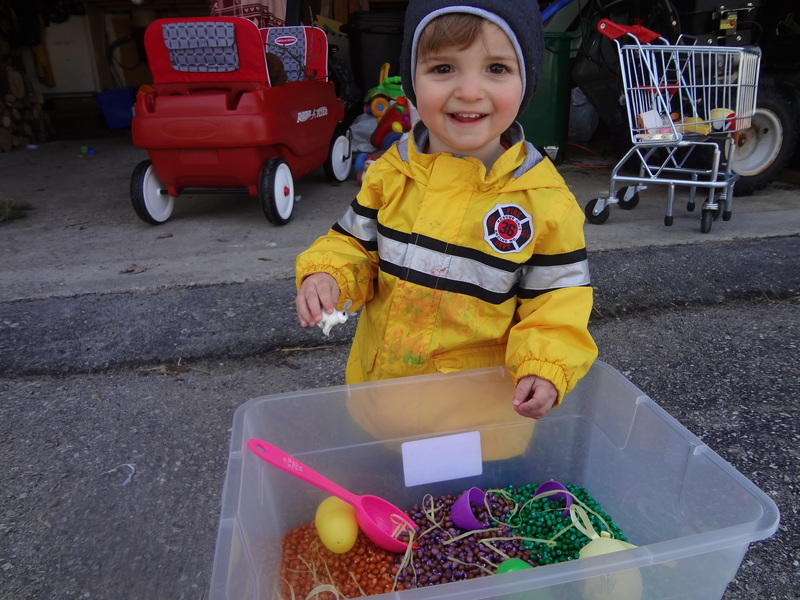 Hopefully this will inspire you to create some Easter fun of your own, thank you for reading and please join us again at Excite and Explore! 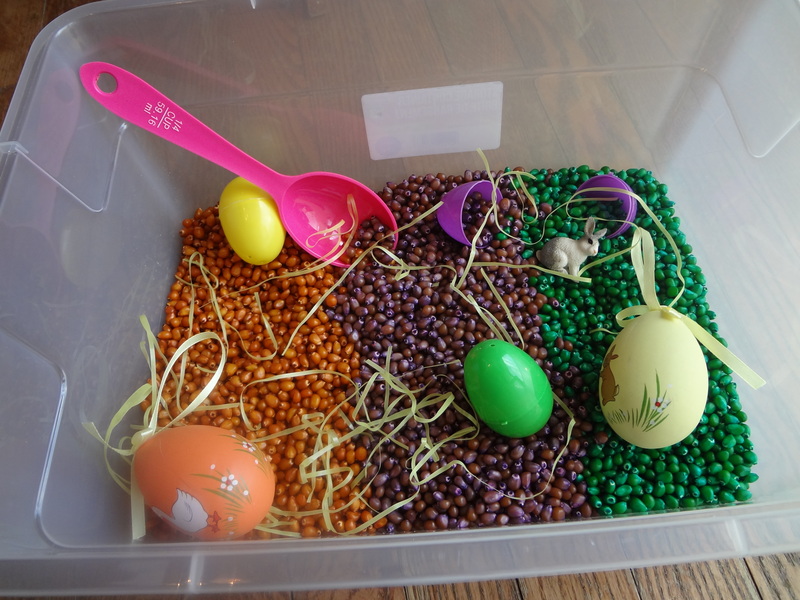 Categories: Sensory Exploration | Tags: Easter, Sensory, Sensory Bin | Permalink.